So how’s this for irony? April is Copyright Awareness Month according to the April issue of PPA’s Professional Photographer Magazine. Terrific, photographers and artists need all the awareness and information about copyright they can get. Anything that spreads awareness of the truth is always positive. But something struck us as, well, a bit odd. 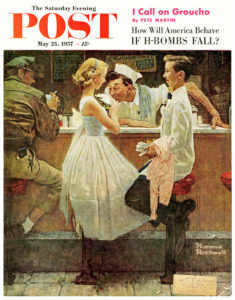 The cover of the magazine is shown, along with a famous Norman Rockwell painting that graced the cover of The Saturday Evening Post in 1957. These two images surely look similar to lots of viewers. Maybe too similar? Maybe a tad too much copying? To us it’s not as much a photograph of “After The Prom” (Rockwell’s title) but more of a photographer “Dancing With Danger”. 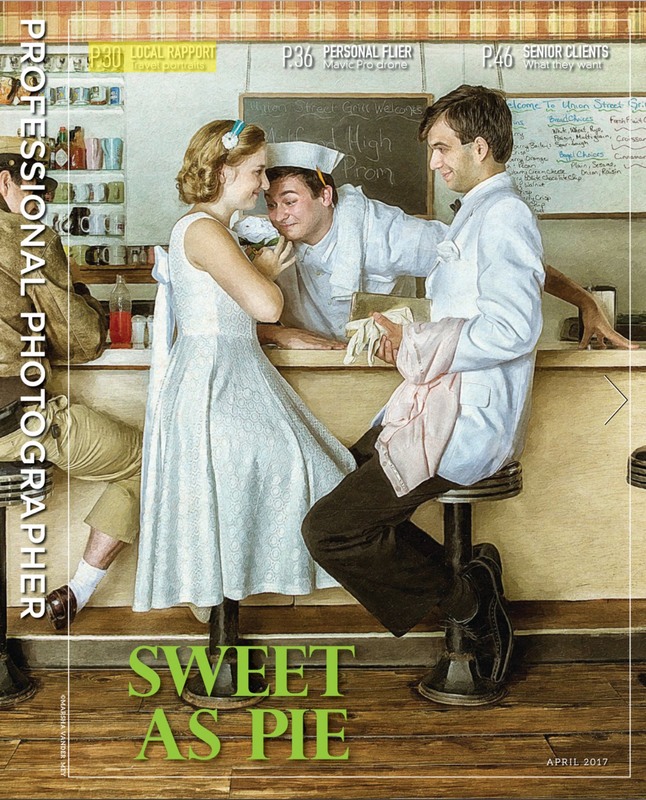 The info supplied about the photographer says the image is “influenced” by Norman Rockwell. We’re sorry, but often the difference between influence and copying is the difference between a lightning bug and lightning (credit to Mark Twain for that analogy). Nearly all artists are influenced by other artists and of course by the world around them. But when as a photographer, you copy numerous details with precision and to a significant extent, you then may find yourself accused of copying someone else’s work. Rather than creating something novel you might be accused of creating an infringement of a registered work created by someone long ago, even before you were old enough to chew on a pencil, let alone draw with one. Theoretically one is not permitted to register a copyright of a copy of another’s work, as it’s not an “original expression”. In this case a comparison of the two images by a jury could yield a determination that that the photo is actually an unauthorized derivative of the Rockwell painting. An unauthorized derivative work can be an infringing work. Different judges and juries could easily come to different conclusions. Looking at these images as a jury would, conjures the phrase “too close to call”. Neither of us would bet the rent on the outcome of a jury’s view as to whether the photo is a copy of the Rockwell illustration. But then we also wouldn’t bet on a jury’s outcome in any case that has two sides, no matter how obvious the outcome appears at first blush. That’s just plain experience on our part. 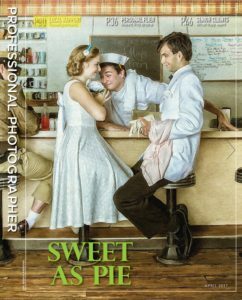 An example of a mere “influence” would be setting up the same scenario in a diner, with a boy and girl and counter person, then letting the scene act out on it’s own and seeing what happens organically. But when the details are copied so exacting with so many duplicated details, the elements provide a skilled litigator with a road map to demonstrate “copying”. It’s like the game they have for kids -see what is different in these two drawings placed side by side. The same “game” is played in the fan magazines using photos of Kim and Khloe placed side by side – find the differences. In this case of painting and photograph however, it’s what can you find that is similar. Duplication of the poses of all four models, the boy holding the girl’s sweater over his arm and holding the girl’s gloves, his white tux, his legs wrapped around the stool, the ribbon behind the girl’s dress, her blue head band with a flower, the pencil behind the counterman’s left ear, the counterman’s hat, the towel over his shoulder, the cabbie’s white sock with the same amount of skin showing, a single key dangling from his pocket, a fat wallet sticking out of his pocket, same jacket on the cabbie, and so on. Can you spot more? Replication of so many nuances of Rockwell’s work is red meat for a trial lawyer attempting to demonstrate willful copying to a jury of lay people. To put this photo on the cover of Professional Photographer Magazine during Copyright Awareness Month is more than a bit ironic to us. Maybe PPA or the photographer can explain the abundance of similarities with facts and circumstances unknown to us. There’s a rule that Ed likes to call “Gibraltar”. You don’t mess with or attempt to chip away at the iconic – even a little bit. The more tidbits of visual information that are included and that look calculated to appear similar to the valuable original, the more likely the owners of the original are going to seek a lawyer to protect their economic interests. Avoiding any similarities to a well-known work is always a safer practice for any artist, author, photographer or writer. Here the two images are close enough for a typical juror to look twice. That second look, coupled with visual details and quirks, is often enough for a jury to find that the newer image is merely a copy (or infringement) of the older, more famous one. Those are the types of scenarios that get photographers sued. When it comes to similarities, if you fear ending up in a courtroom, it is best to rely on the artistic concept of “less is more”. We are not making any determinations here. We simply urge all creators regardless of their mediums to avoid the appearance that their work and/or aspects of it may have been appropriated from an already existing famous work. Otherwise what you smell may not be a prom dance corsage. This entry was posted on April 5, 2017, 10:53 am and is filed under Be Aware, Copyright, Fine Art, Legal Things, Stuff you should know, You can't make this up. You can follow any responses to this entry through RSS 2.0. You can leave a response, or trackback from your own site. I’m sure you have permission from the makes to use there images here, correct? There just ain’t no fixen stupid. Hey Tim, Good point and I’m glad you asked as it presents a great teaching opportunity. Actually we don’t need to ask permission for two reasons. One is that the entire magazine covers are used. Posting the Saturday Evening Post magazine in it’s entirety was done specifically rather than trying to get an image of just the painting. If we cropped it, it would could be a problem. But not in this case because of the next issue. The second issue is that we discuss these specific images, they are the complete subject of the article. If we did a generic or general article about Norman Rockwell or of the subject of copyright infringement, then there is no reason to use these specific images and using them could be a problem (other then the fact that they are magazines, which is another issue). So because the article is a point about these specific images, because we used the entire magazine covers, we’re OK. Copyright law is sometimes not simple and you need to know the subtleties of it. That’s why we try and do as much education as we can on the subject. Regarding the use of the images from the other publications in connection with a commentary of and concerning those very images/uses – we suggest that readers take a look at the “fair use” section(s) in our book The Copyright Zone and in this blog. To Vivian: on several occasions over the years we have filed copyright infringement suits against persons, celebs and companies who were at that very moment simultaneously suing a third party for infringement of their songs, IP artwork etc. This gave us the opportunities to use their papers in the unrelated suits in our litigations – especially the parts that discuss how “copyright = $$$”. That is why defendants’ attorneys also say “We take matters regarding intellectual property seriously”. True – when it is THEIR IP that is being stolen. Just to clarify, my comment “there just ain’t no fixen stupid” was directed at the subject of this article rather than the comment which preceded mine. Ron White just called. Its, “You can’t fix stupid”. No worries as I talked him out of suing you alleging that you created a derivative work.